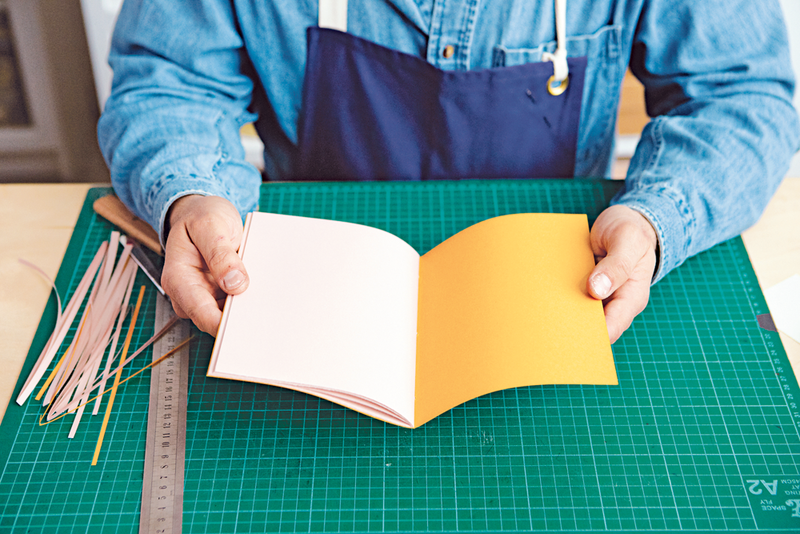 Give the basics of bookmaking a try by crafting this nifty three-hole pamphlet. First make two sections from your A2 sheets of paper. Take one sheet and fold in half, short edge to short edge. Make sure the edges are exactly aligned, before making a sharp crease using your bone folder. Slit the paper two-thirds of the length along the fold using a shoe knife. This helps to avoid ‘crow’s feet’ or wrinkles from forming at the corners of the folds. Turn the folded sheet 90 degrees and fold the sheet a second time. As before, slit the sheet two thirds of the way using a shoe knife. Turn the folded sheet 90 degrees and fold the sheet a third time. Do not slit the sheet again. You now have an A5 16-page, or octavo, section. Repeat with second sheet of A2. Take your two octavo sections (16 pages each) and combine the two sections by inserting one inside of the centre fold of the other (step 1). This will give you a 32-page section. 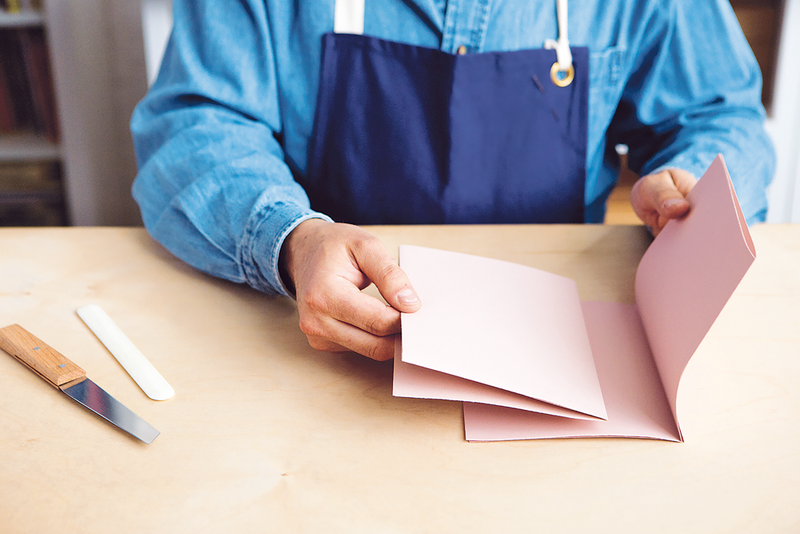 Fold the A4 cover paper in half widthways, or short edge to short edge. Make sure the edges are exactly aligned before making a sharp crease using your bone folder (step 2). Make a sewing station template: take a piece of waste paper and cut to the same height as your pamphlet and roughly 60mm wide (step 3). Make three marks on the edge of the waste paper (step 4): one at the centre (find this by folding the sheet in half lengthwise) and two at either end, around 30mm in from the top and bottom. The sewing stations will be at these points. Place the section inside the folded cover (step 5). Lay the book on the work surface with the spine edge aligned to the edge of the work surface. 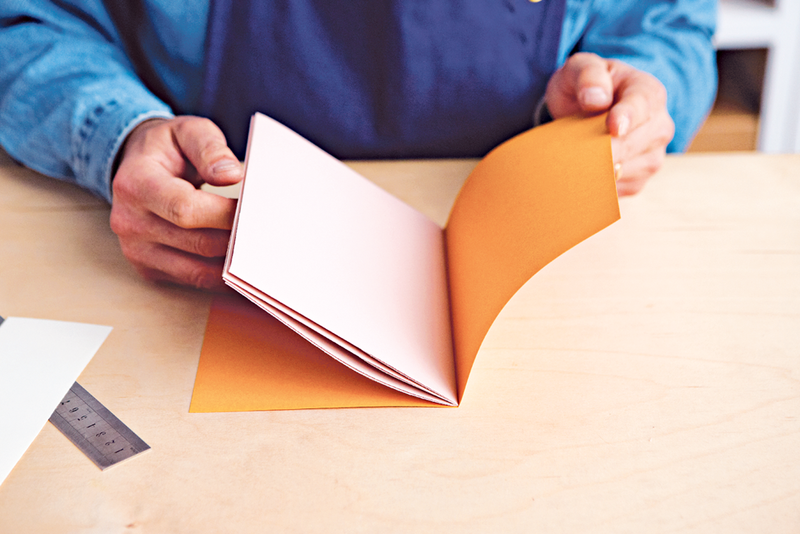 Open the book to the centre fold and place the sewing station template along the fold. Using an awl or pricker, make holes at each of the sewing stations (step 6). With a needle and about 60cm of linen thread (or a length 2.5 to 3 times the height of the book), begin stitching the section from the centre hole, station B (see step 7). From the outside in, insert needle and thread at station B, leaving a tail end of approximately 3cm. Bring the needle out through the top hole, station C.
Go along the spine and in again at station A, then out through central station B. Tie the two ends of thread together with a reef knot and trim any excess thread (step 8). Make sure that the two ends are on either side of the thread running from A to C, so that the knot is firmly in place. 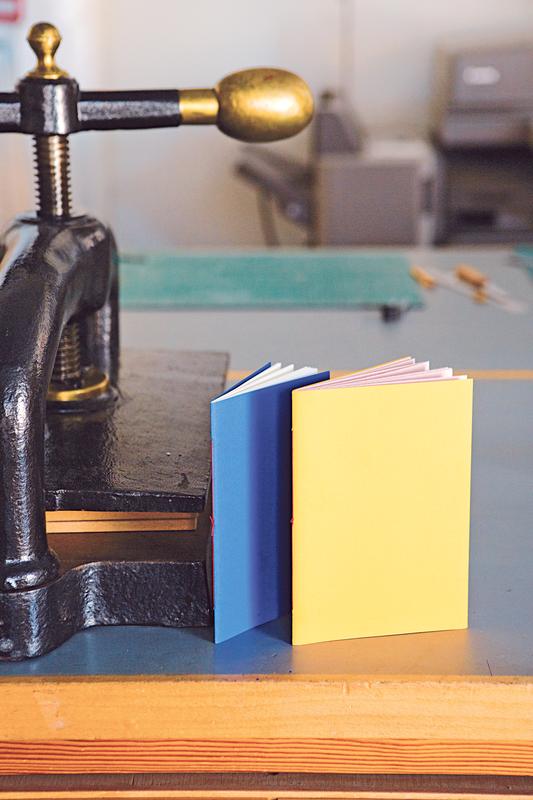 Once the book has been bound, close the book, place a sheet of waste paper over the spine and go over the spine with a bone folder. If desired, trim the book. Extracted from Making Books by Simon Goode and Ira Yonemura (Pavilion).